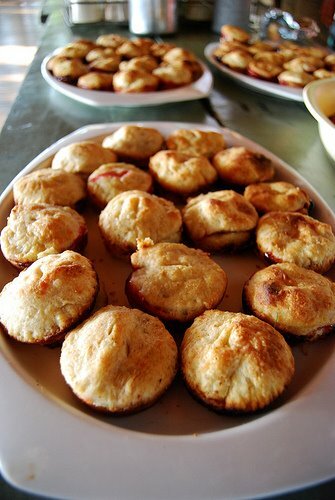 Nothing in the House: Mini Pies Multi Plies/Multipies Miniplies, or A Pie for Everyone! Mini Pies Multi Plies/Multipies Miniplies, or A Pie for Everyone! To make them I made the crust and filling as per usual (use any favorite regular pie recipe), and then cut small circlular top and bottom crusts using the rim of a glass. I greased and floured each cupcake mold of a cupcake pan and put in the bottom crust, forming it to the cup. Then I added about 2 Tblsp. of filling (as much as the bottom crust would allow and still be able to close). Then I added the top crust, and pinched the sides shut as best as possible, sometimes using my fingers and sometimes using a fork. I pricked holes in the top crust of each pie, and baked them for about 20-30 min. at 375. They popped out of the pan easier than I thought. beautiful pie pics by Helen! Voila! Petite pies...the personal pleasure of your own personal pie! i did this for a halloween party last year! only i didn't make crusts like that. i made little pumpkin pies, and crushed up gingersnaps in a plastic bag with some melted butter, which i then poked into little foil cupcake cups and poured pumpkin batter over. 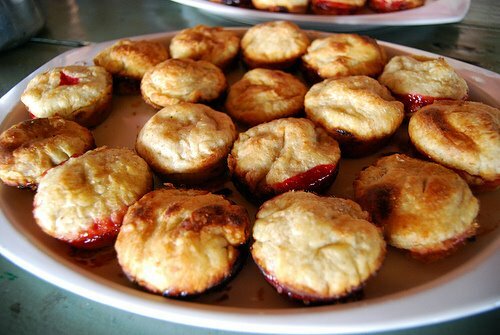 they were little pie cupcakes. i wish i had pictures! 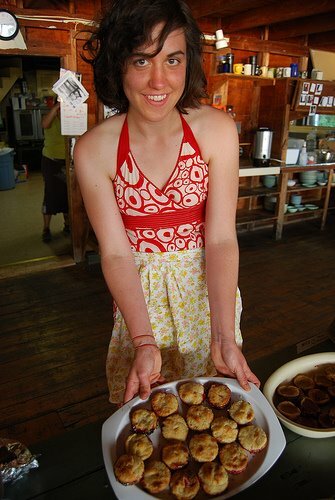 emily--i dream of multiple mini pies often and wake up sometimes in a pool of drool, yearning for berries sandwiched by and baked in pastry crusts. i miss you more than those delicious pies though. ooh thanks, dear helen! give baking pies a try... it is not so hard of a thing to do!